At the German Center for Aviation and Cosmonautics, 149 searchlights were installed and lit them all at the same time. The purpose of the experiment is to try to obtain energy for the production of hydrogen fuel. 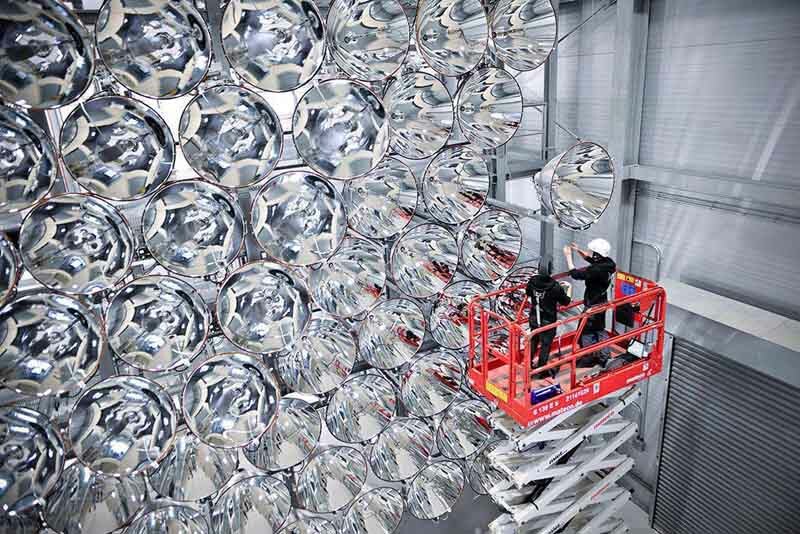 An experiment called Sunlight is produced in Germany near Cologne. “Artificial sun” consists of 149 spotlights. They are installed in a chamber protected from radiation. Simultaneously working lamps produce light at 10,000 times more than the natural solar. When all the spotlights are turned into one point, a temperature of about 3500 degrees Celsius is created there. “If you enter the room when the lamps are on, you will instantly burn,” warns the research director of the German Center for Aviation and Cosmonautics, Professor Bernard Hoffschmidt. The purpose of the experiment is to develop an optimal method for obtaining large volumes of solar energy. They are necessary for the separation of hydrogen from water vapor – environmentally friendly fuel for aircraft and cars. Climate change is accelerating because of large-scale carbon dioxide emissions into the atmosphere. Scientists hope to spur progress and solve one of the most important environmental problems. There is hope for success, because solar power plants have already proved themselves well. In them, light is focused on water using mirrors. As a result, steam appears, which rotates the turbines and generates electricity. While the “artificial sun” uses a huge amount of energy. For four hours of work, it consumes as much electricity as four houses a year. In the future, scientists hope to use natural sunlight for production.